There are many Halloween activities in Forest City for your family! Trick or Treat in Forest City is from 5pm to 7:30pm on October 31st. 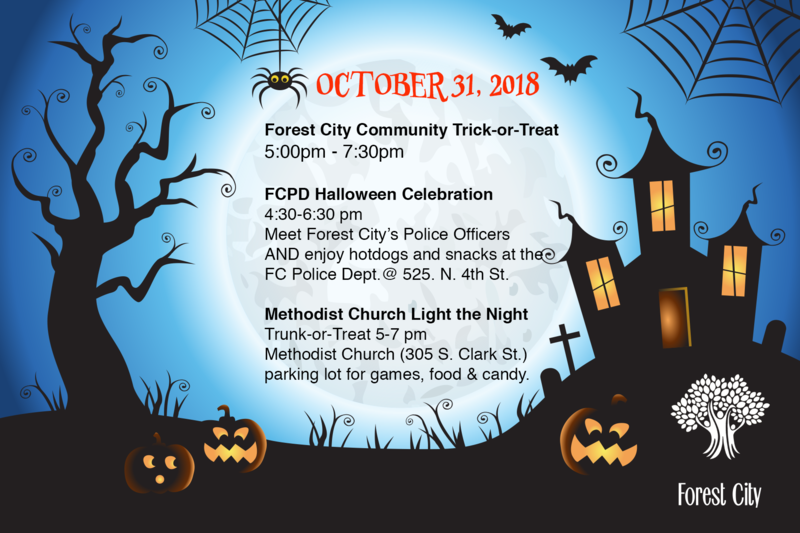 Forest City Police Department is hosting a Halloween celebration from 4:30-6:30pm. Meet the officers and enjoy hot dogs and snacks at the Police Department(525 N. 4th Street). Methodist Church Trunk or Treat from 5-7pm at the church parking lot (305 S. Clark Street). Games, Food and Candy. Waldorf Theatre Haunted House “Night at the Swamp”, October 25-27, 7-10pm, $4.00 entry or $3.50 with a canned good. 5k Halloween Costume Run/walk, October 28th, Pammel Park. 8:30 am – 11:30am. Sponosred by Waldorf Biology. Onsite registration begins at 8:30 A.M, Race begins at 9:00 A.M. Entry cost is $5 for adults and $3 for children 5 and under OR a $20 entry fee, which includes a t-shirt! (adult sizes only).There will be a pumpkin carving contest! BYOP (BRING YOUR OWN PUMPKIN) There will also be prizes AND A BAKE SALE! Come show off your costume and have a good time! Halloween at the Fieldhouse, October 31, 5-9pm. Join the Women’s and Men’s Basketball teams for their games against Mount Marty at 5:30pm and 7:30pm. Everyone that comes in a costume and says the magic words (hint: Trick or Treat!) will get a piece of candy. Stick around for the Costume Contest during halftime of the men’s game. If you don’t have a costume, we will have Halloween masks to color (while supplies last). All ages are invited to participate! Free Halloween Meal at Immanuel Lutheran Church,246 South Clark Street from 4:45-6:45pm.